This article submitted by Erin Aagesen on 6/28/00. The community of Paynesville has always had a strong tradition of arts involvement. Whether it be school ensembles, church choirs, amateur musicians, or summer acting companies, many individuals are active in the arts. Until last November, however, these artists had nowhere to turn for ideas, assistance, or financial support. That's where the Consortium for Creative Arts comes in. Rather than organizing specific events, the seven-month-old group exists as a forum for promoting the arts in a variety of ways. 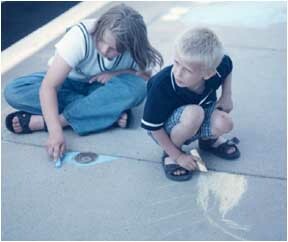 These kids drew on the sidewalk during the sidewalk chalk contest sponsored by the Consortium for Creative Arts on Tuesday evening during Town & Country Days. "Everyone has different ideas," said Jeff Thompson, who played a key role getting the group started. "The consortium is the place where they will all come together." Gretchen Vork, a consortium member, said, "The main objective is to raise the profile of art and artists and increase the opportunity for artistic expression." Thirty-five charter members belong to the Consortium for Creative Arts, though anyone can come to the meetings with their concerns. They meet every three months, with the exact dates regularly published in the Press. Stacy Wall is the current president of the organization. Doris Dodds is the first vice president, and Jim McCalmant is the second vice president. Antonia Kerr serves as secretary, and Becky Thompson is the treasurer. Board members are Erin Kerr, Dean Seanor, Steve Gralish, and Ian Pelton. Erin Kerr admits it's not always easy to get what is needed arts-wise in a small town. "We're doing everything we can to support the artistic cause in Paynesville," he said. And it's working. The group is excited about the prospect of the new auditorium and plans to work with the school district in utilizing the facility as much as possible. Members of the group waited tables and helped with ticket sales at the area center this spring during a dinner theatre production. They had a stand at the Farm and Home Expo to get their name out. At last week's Town and Country Days celebration, the consortium organized both the Family Chalk Contest and the Kid's Painting Booth on Tuesday afternoon. On Monday, June 26, they helped sponsor an arts auction at the area center. They are in the process of compiling an artist directory so people can get in contact with others involved in the arts. A calendar of arts events is regularly updated, and can be accessed through www.paynesvillearea.com. The consortium is also working closely with the Koronis Theatre Company this summer to put on a production of the musical, "Into the Woods." It will be staged in late July. Future plans include adding murals to buildings around town to link the community and the arts. Kerr, a professional set designer, will be painting the first one this summer, with help from volunteers, on a wall by the public library. Other possible mural sights are on the walls surrounding the new Kindness Garden, between the Home Enhancement Center and Steve Whitcomb's State Farm office, and at Wally's G&T Foods. They would also like to get artwork done by community members put up inside the library. "There are a lot of ideas floating around," said Becky Thompson. The group also is in the process of gaining recognition as a nonprofit organization. Their original name, Creative Consortium, had to be changed to its current title because it had been used by another group. Once nonprofit status is achieved, the organization will be able to apply for arts grants for things like theatrical productions. They will also be able to facilitate other community groups in applying for grants. Nonprofit status also allows donations to the group to be tax deductible. The Consortium for the Creative Arts will remain open to anything which supports the arts. "We're all here because we love this stuff. We're here to help," said Erin Kerr.